A pizza franchisor had an expiring credit facility with the interest rate about to increase dramatically. The Company also requested to consolidate the existing officer loan into the refinance. The Company has a strong three-year trend of positive earnings and EBITDA, but did not meet the minimum levels required for a traditional leverage transaction and there were no current or fixed assets to support the loan as collateral. Concord utilized a detailed memorandum featuring the Company’s strong and sustainable cash flow, growth into new markets and profitability. 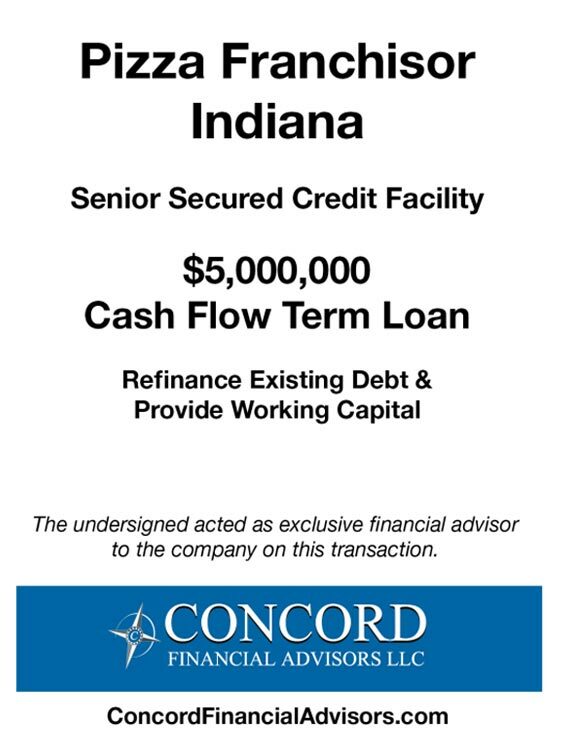 After conducting a targeted process to local, regional and national commercial banks, Concord secured a commercial banking proposal that met the Company’s objectives and closed the deal in under 90 days.